Interactive voice response (IVR) is a technology that allows a computer to interact with humans through the use of voice and DTMF tones input via keypad. 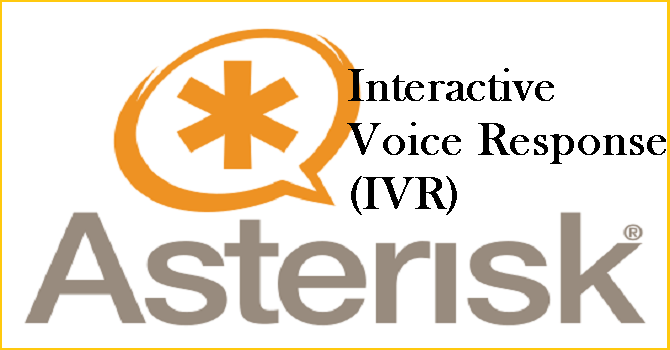 Setting up an IVR functionality on Asterisk is pretty much simple, but you will need to be a little techie to make it functional. We will be setting up live phone number, when called, prompts the user to "press 1 for Sales, 2 for Tech Support and 3 for Billing department". If the caller presses one the call will be transferred to the sales number, if they press 2 the call will be connected to tech support and so on. In this guide, we will walk you through the steps to configure an IVR server on asterisk using Ubuntu or Debian Linux. First we need to download and install Asterisk, then we will build out an "Asterisk Dialplan" (this is simply the program that tells Asterisk what we want our IVR to do), we will then use the softphone Linphone (ie: phone on our computer) to test our IVR application to make sure it's all working properly. Lastly if we want to take your IVR system live, we will setup a real phone number (to handle inbound calls) and a SIP trunk (to handle outbound call). Because we work at RingRoost, we will use them as our inbound/outbound call carrier in this example, you may of course use any carrier that suits your environment. Make sure you have the most recent flavor of Linux installed. I'll be using an Ubuntu 14.04 machine in this example. We have already covered step by step installation and configuration guide in our earlier article How to Install Asterisk on RHEL, CentOS, Fedora or Ubuntu. Please go through it. Now, lets build out the IVR. To keep things simple at first we are just going to have our IVR say a few digits, this way we can connect to the IVR and make sure everything is working. Edit your Asterisk sip.conf file found at "/etc/asterisk/sip.conf" in your favorite editor and put the below code in it. Note: make backup of sip.conf and remove all code that is currently in the sip.conf file. If the file does not exist, create it. Now, edit your Asterisk extensions.conf file found at "/etc/asterisk/extensions.conf" and add the below code in it. Note: make backup and remove all code that is currently in the extensions.conf file. If the file does not exist, create it. We will now dial into our asterisk server on Linphone. In the "SIP address" bar input "sip:30@asteriskipaddresshere" and dial it (green icon). You should hear a voice say 1234. First, we need to do is get a phone number with RingRoost and point that number to our Asterisk box. You will need to create a RingRoost account here , if you don't have one , add some funds to get started, and then order a number under the number tab here . Now go ahead and call your Ringroost phone number and try out your new IVR call system. Now when someone presses 1,2,3 they will be connected to that particular phone number instead of just hearing a recording.